The Friend of the Expo award went to C.J. Brown and Joe Foster (center). They were joined by J.L. Draganic (left), Sasha Rittenhouse, and Pam Haley (far right). COLUMBUS — A large crowd of beef cattle enthusiasts once again packed the halls at the Ohio Beef Expo March 14-17, gathering for the 32nd edition of the state’s premier industry event. The event offers a wide variety of opportunities for youth and adults, including breed and market shows, a breed auction and a trade show that features a little of everything related to beef cattle production and rural living. Melissa Rupp, an Extension educator from Fulton County, made her first visit to the Expo with her husband, Doug. The couple raises Angus cows and they feed out Holstein steers in Williams County. Melissa, whose daughter shows locally in 4-H, said her first Expo experience was eye-opening and gave her some new ideas that could help her own operation. While exhibitors take the shows and sales seriously, the Expo is also a place to meet other producers and enjoy the camaraderie of the cattle industry. Jim Starr, 84, and his son, Rick, 63, attend about every year to watch the Hereford sale and meet friends from the past. The two Ross County men brought cattle to the Expo regularly until about 2011, but have continued to come back each year. “We’re out of the business now, but we come up to visit our Hereford friends and see good cattle and visit with the people and see what all is new in the trade show,” Rick Starr said. Rick said one of the things that impresses him most is the size of the Expo and its growth over the years. He said when he travels the highway, it seems like there are fewer and fewer cattle producers along the countryside, but when he arrives up at the Expo, there are as many cattle and producers as ever. The growth and success of the Expo is made possible by many contributors, including the staff at the Ohio Cattlemen’s Association. 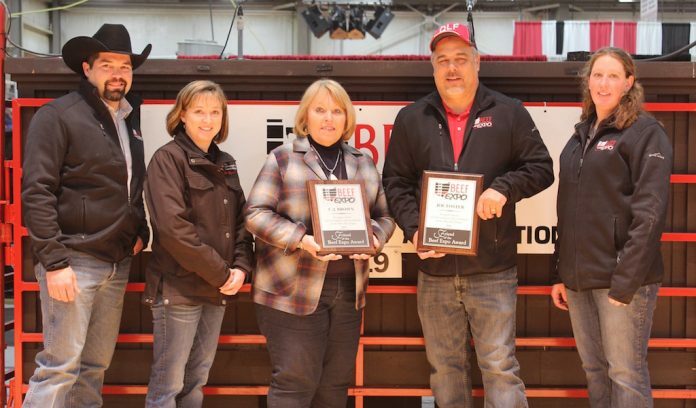 Keeping with tradition, the OCA recognized two outstanding Expo leaders this year, known as the Friends of the Expo. This year’s honor went to Joe Foster, of Plain City, a sales manager for Quality Liquid Feeds; and C.J. Brown, a painter and artist from Lindewood, Illinois, and owner of C.J. Brown studios. Foster helps youth and other cattle producers understand nutrition, offering solutions to improve feed rations and digestibility. His sales area covers Ohio, southern Indiana, Virginia and W. Virginia, where he helps livestock producers determine the right ration for their animals, and the right liquid supplements, including molasses. Foster said he enjoys the Expo because it’s an opportunity to get re-acquainted with friends and make new friends. He has an extensive history with beef cattle, which includes his own showing experience, and he said it’s good to be re-united with the same group of people. Foster also serves on the Expo trade show committee, and he’s involved with the Allied Industry Council, where he helps promote and grow the state’s beef industry. Brown brings a wide variety of cattle- and farm-related paintings to the Expo each year, inspired by her lifetime involvement with cattle, and her desire to share the rural experience through her artwork. Brown also creates unique artwork for each Expo, including the 30th anniversary celebration in 2017. She uses her artwork as a way to connect with consumers and communicate an accurate image of farm life. “I look at my work as a way to historically document what the rural lifestyle is really like in our rural country,” she said. Next articleIs it climate change, weather weirding or land use impact?